Last night, Andrew and I wanted to escape the dead of winter we were experiencing in San Francisco, (seriously so freaking cold and windy) so we ran up to Corte Madera to pick up Andrew's new backpack at REI! We turned it into a mini date night with a froyo stop in Larkspur. I had never been there before, it has the cutest little downtown! The frozen yogurt shop was called Mag's which couldn't have been more perfect since that was a nickname for Andrew (shortened version of his last name). I had the Tropical Tart, it tasted like the juice they serve on Hawaiian Airlines! Topped with some coconut, berries and a few sour worms and circus animal cookies for good measure! 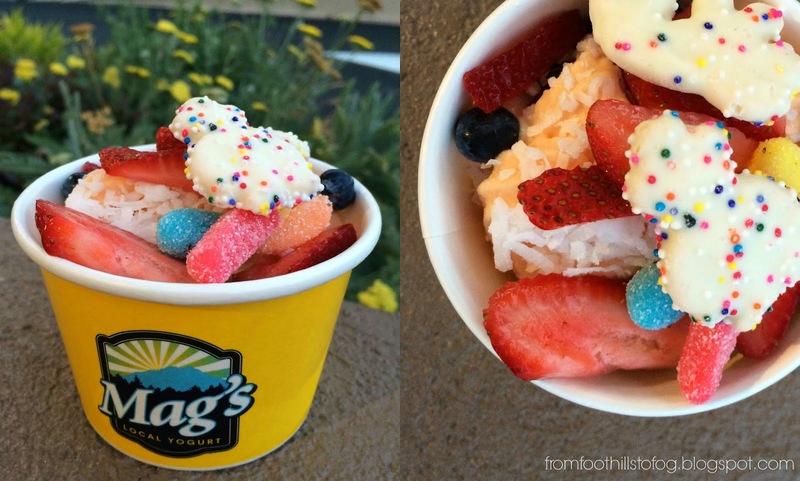 What are you favorite froyo flavors and toppings? Girl just head to Walnut Creek it was 103 on Sunday! WOOF! That looks so good! My mouth is actually watering. That looks so good! I'm starving right now. I love cookie dough froyo with roasted almonds. The Yogurtland I go to needs to step up their game, Mag's looks delicious! I love fresh strawberries & Butterfinger bites! Nomnomnom ... Isn't it crazy how the whole microclimate thing works in this city? Yesterday it was mostly sunny and almost 70 in my neighborhood! Man, now I really want some frozen yogurt. I'm not a big sweets person, but I cannot resist a Yogurtland froyo.